TORONTO — Shoppers Drug Mart is rewarding Shoppers Optimum members as the customer loyalty program celebrates its 15th anniversary. 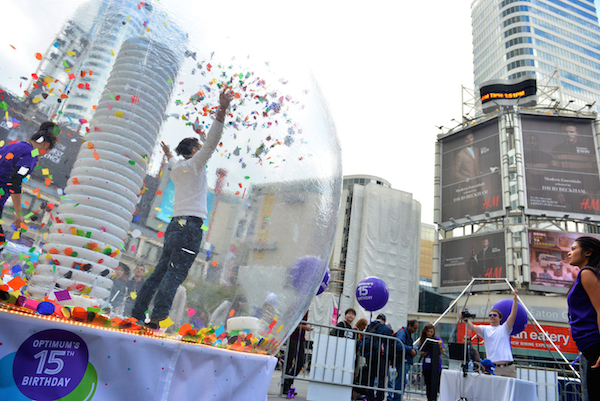 For Shoppers Optimum’s anniversary event, people were invited to enter a confetti globe in Toronto’s Yonge-Dundas Square for a chance to win prizes. Canada’s largest drug chain said that on Wednesday in Toronto’s Yonge-Dundas Square the public can enter a life-size confetti globe for a chance to win a Shoppers Drug Mart gift card and be entered into the grand prize drawing for a vacation for two to a Royalton Luxury Resort in Cuba, Mexico, Jamaica or Dominican Republic, provided by Sunwing Vacations and valued at $4,500. In stores and online from Oct. 10 to 24, the retailer will give away a range of prizes — including 15 luxury vacations, 15 prizes of 500,000 Shoppers Optimum Points, prepaid MasterCards and Shoppers Drug Mart gift cards — through an online game as well as provide in-store offers on select products. Shoppers Optimum has grown to more than 10 million members since its launch in 2000. This spring, Shoppers Drug Mart expanded the program with “My Optimum. My Rewards.”, a new offering that brought an enhanced Shoppers Drug Mart app and a digital Optimum card. Members can now receive personalized offers and points via their mobile device, email or the web and load them to their digital or plastic Optimum card. They can also scan their digital Optimum card directly from their smartphone to earn and redeem points. Part of Loblaw Companies Ltd., Shoppers Drug Mart has 1,258 drug stores under the Shoppers Drug Mart and Pharmaprix banners across Canada, as well as 51 Shoppers Simply Pharmacy/Pharmaprix Simplement Santé medical clinic pharmacies, six Murale luxury beauty stores and more than 50 Shoppers Home Health Care stores.